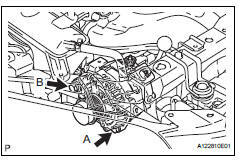 Confirm that the wire harness of the crankshaft position sensor is secured to the wire harness clamp bracket through the back of the rib of the timing chain cover. Install the generator with the 2 bolts. 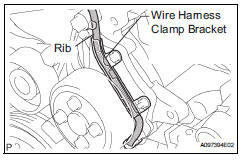 Install the wire harness clamp. Install the wire harness clamp bracket with the bolt. Connect the generator wire with the nut. 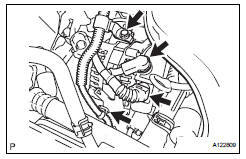 Install the belt (see page em-7).